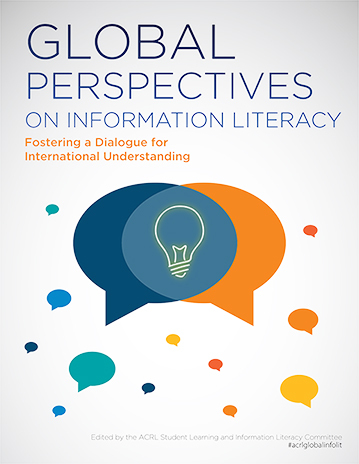 ACRL’s Student Learning and Information Literacy Committee (SLILC) announces the publication of a new white paper, Global Perspectives on Information Literacy: Fostering a Dialogue for International Understanding. The paper includes chapters written by information literacy experts from around the world, including Africa, Canada, Europe, Oceania, Asia, Latin America, and the Middle East, and seeks to share individual international perspectives that demonstrate how information literacy is viewed, taught, and conceptualized internationally. Research trends: What kind of IL-related research is being done in your country or region that has impacted your approach to teaching? Models of information literacy: What standards / frameworks / models / learning theory / pedagogy or specific paradigms do you most often use for inspiration in your teaching? Theory and practice = praxis: Describe the connection between information literacy and student learning from your position or perspective. Alternatively, what is your teaching philosophy? Role of librarians: What is the role of librarians in the higher education landscape of your country or region? How were/are you trained to become a teaching librarian? Future visioning: Think about the future of information literacy for your region and share your vision for what you think that might look like in the next 5–10 years. A final reflection explores themes presented by the authors, including an overarching shift to an increasing conceptual approach to information literacy; a growing enthusiasm for the teaching role of librarians; a responsibility to prepare our students to live and work in intercultural settings; a growing focus on the intersection of critical pedagogy and information literacy; and the challenges presented by translating information literacy work into multiple languages. Please join the authors and the Student Learning and Information Literacy Committee for a panel presentation and open discussion to discuss the white paper at the upcoming ACRL 2017 Conference in Baltimore. The panel presentation will take place from 1:30 – 3:00 p.m. on Thursday, March 23, in the Baltimore Convention Center, room 341. The open discussion will take place from 4:00 – 5:00 p.m. on Thursday, March 23, in the Hilton Key Ballroom. Global Perspectives on Information Literacy: Fostering a Dialogue for International Understanding is freely available on the ACRL website (PDF). For more information about the white paper and to watch the archived webinar with foreword author, Emma Coonan, please visit the SLILC homepage. Join the conversation on Twitter: #acrlglobalinfolit.